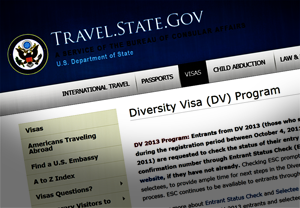 The visa lottery has been criticized for many reasons. It admits people at random, regardless of skills or family connections, bypassing thousands on waiting lists for other immigrant visas. It represents a security vulnerability because it is used disproportionately by people from terrorist-producing countries. And its purported effect on the “diversity” of our immigrant intake is exaggerated. But few have probed the consequences of our visa lottery on the foreign countries whose citizens use it. It is no secret that winning the U.S. visa lottery is a golden ticket out of many developing countries. B. Ikubolajeh Logan and Kevin J.A. Thomas, researchers at Pennsylvania State University, addressed this question in their 2012 article “The U.S. Diversity Visa Programme and the Transfer of Skills from Africa”, which appeared in the journal International Migration. They examined the extent to which the visa lottery has enabled a brain drain of professional and technical workers from Africa to the U.S. and what the economic and policy implications of that movement are. Despite its salutary objective and design, the program’s implications for the African brain drain may not all be benign... The costs of transforming a lottery win to an actual diversity visa and Green Card are so high that only Africans in well-paying jobs, who are likely to be professionals rather than mere high school graduates, are likely to be able to afford the full costs of program participation. In this sense, the program has an in-built, skills-selective mechanism. While there is no cost to enter the lottery, nor does it require any special skills, winners need to pay a $330 fee to be interviewed at the U.S. consulate. In addition, of course, they need to be able to pay the travel costs to get the United States. Because the countries of sub-Saharan Africa have the lowest per-capita GDPs in the world, only the well-off (by local standards) are able to afford these costs. They may not have high skills in the context of a developed economy (if they did, they could qualify for various skills-based visas), but in the context of a developing country, they represent a vital pool of talent. Thus, in Africa at least, the visa lottery contributes to brain drain. Of course, the U.S. visa lottery is not the only factor contributing to Africa’s brain drain. In many cases young, skilled Africans migrate to more-developed countries in Africa or to Europe or Australia. But there are ethical considerations when addressing the merits of this program and the potential effects that it has on other countries.